The Bread Workshop is a combination café and artisan bread bakery in Berkeley. They focus on seasonal, sustainable, organic, healthy and delicious foods served in a comfortable atmosphere. From our table we had a view of the small team of bakery workers, hustling to get hundreds of loaves of bread packaged and ready for next morning delivery to local restaurants. We sat beside a table of young medical students (including the above guy named Sawyer) who were studying and discussing gastroenterology and what symptoms equaled which diseases—not the most appetizing dinner conversation, but interesting nevertheless. The back of the large “Inferno” oven faced the café and was sparkly clean and decorated with little lights beside a bulletin board. 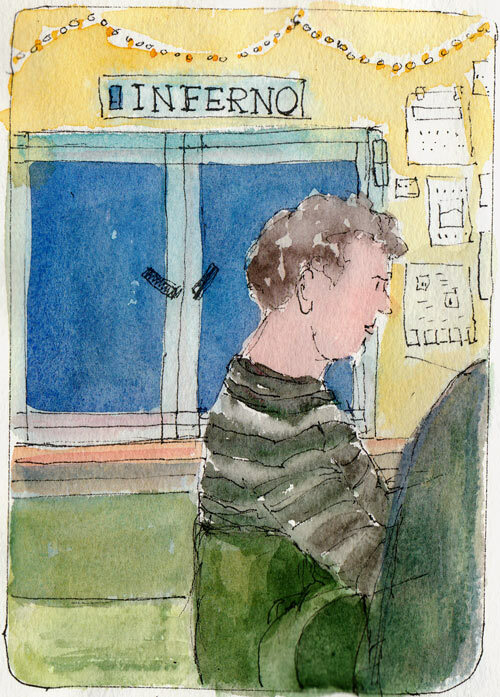 I stood in front of the counter where you order (above) to sketch and then painted it at our table. This was really fun to draw. My grilled chicken breast had been marinated in a yogurt sauce first and it was spicy and delicious, the grilled veges were fresh and tasty and they even had brown rice. A great evening of sketching and dining! Now this is a place I’d like to see open out here in Texas! I would visit everyday! 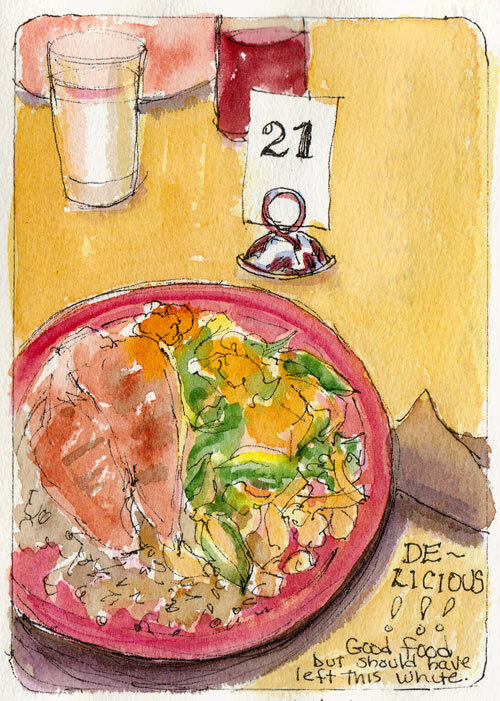 Wonderful sketches, and I like that you didn’t leave the background of the table white! Your post brought a big smile and wonderful memories of dinner conversations–my wife, an RN, myself (MD) and three college/high school age children all discussing their latest cases, experiments and new knowledge in biomedicine. The first time our daughter brought her boyfriend (now husband) to dinner with us, we had our usual conversations, and he turned a little green. We still laugh about it. He’s getting better now and it doesn’t bother him. Your sketches are always wonderful. Hi Merle, That’s a funny story. I was reading a memoir by a psychiatrist, “Weekends at Bellevue” the week we sketched there, as I’m fascinated by medicine and the psyches of doctors (who I’ve found to be some of the most creative people I’ve known). Some of the stories in that book made for not the best bed-time reading, let alone dinner reading! I used to work for The Bread Workshop many years ago before their relocation. I was my first introduction to Artisan bread. I miss their New York rye. So what IS it about artisan bread that I’ve been so much about lately? I think I’ll have to check it out for myself….. 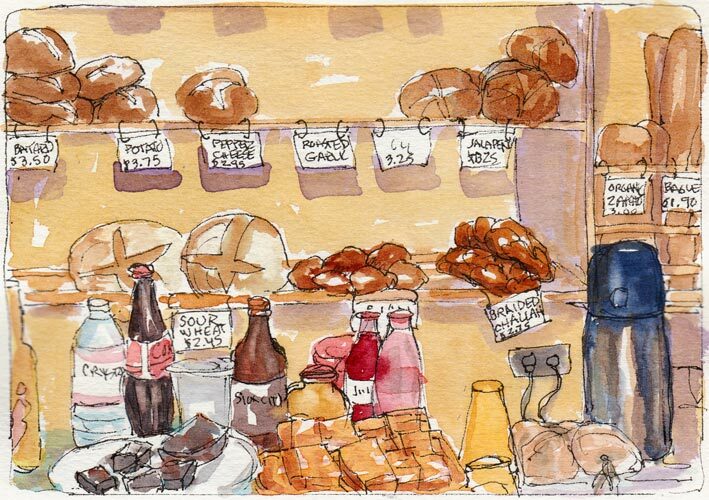 Looking at your bread shelf sketch is making my mouth water. 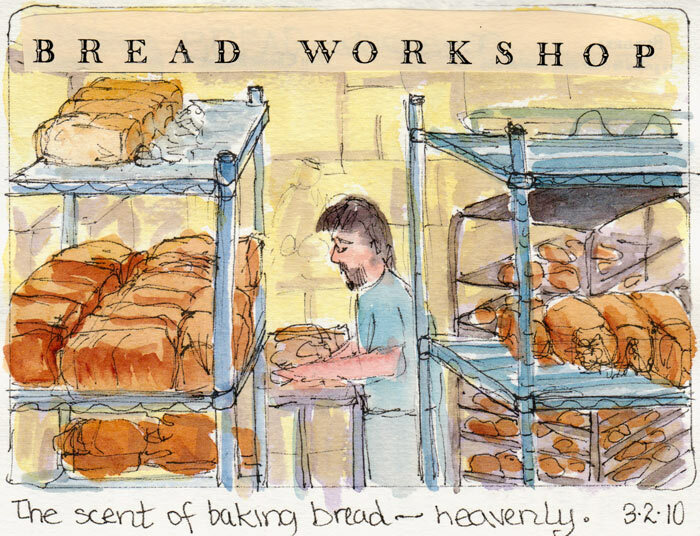 Hello Jana – I love your watercolors about the scenes at the Bread Workshop. I have a request to ask you. We are facing some serious “sustainability/viability challenges” this coming year & would like to use one of your watercolors “Packing Bread” in our appeal via email to our customers & community. Would that be OK with you? I will send you a copy of our appeal & put your name under the artwork.